With Central Florida being one of the top tourist destinations in the country, it is not uncommon to see a bit of duplication in the amusement arena. 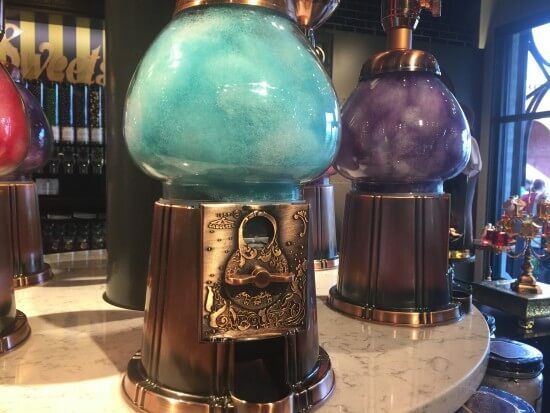 For example, there are multiple escape rooms, a few churrasco houses (Brazilian steak house) and both Disney and Universal have their own dining district outside of their theme parks. 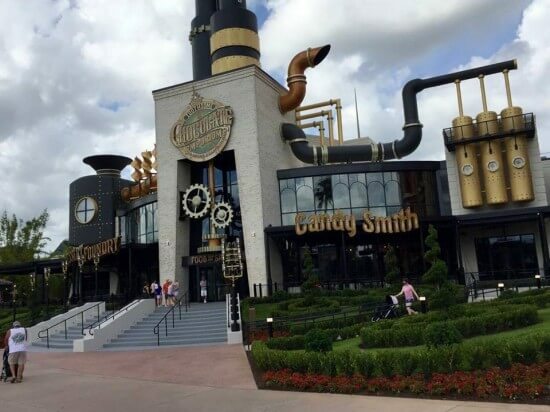 In this story, we’ll compare Orlando’s two mega sweet spots: Sugar Factory, which opened at the Orlando 360 complex in March of this year; and Toothsome Chocolate Emporium and Savory Feast Kitchen, which just opened at Universal Orlando CityWalk. Both locations feature a sweet shop, specialty desserts and ice cream as well as mouthwatering menus. The following review and comparison is based on a personal visit to both locations over the weekend of October 29th and 30th of this year. Toothsome was enjoyed for lunch around 2 pm on Saturday and reservations were made for breakfast at Sugar Factory the following morning at 11:30 am. 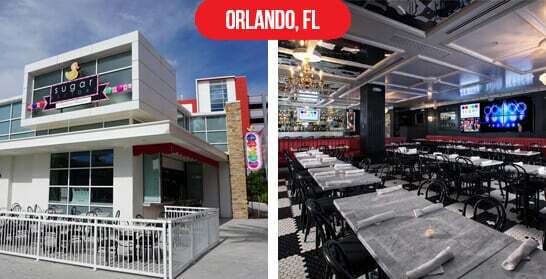 Accessibility: Sugar Factory uses the parking garage for Orlando 360, which is both free and located much closer to the restaurant. Additionally Sugar Factory offers dining reservations via Open Table. Toothsome, being part of the same complex for two theme parks is a pay to park (around $20 dollars, parking is free for FL residents –with proof of residency- after 6 pm except during Halloween Horror Nights). At this time Toothsome does not accept reservations. 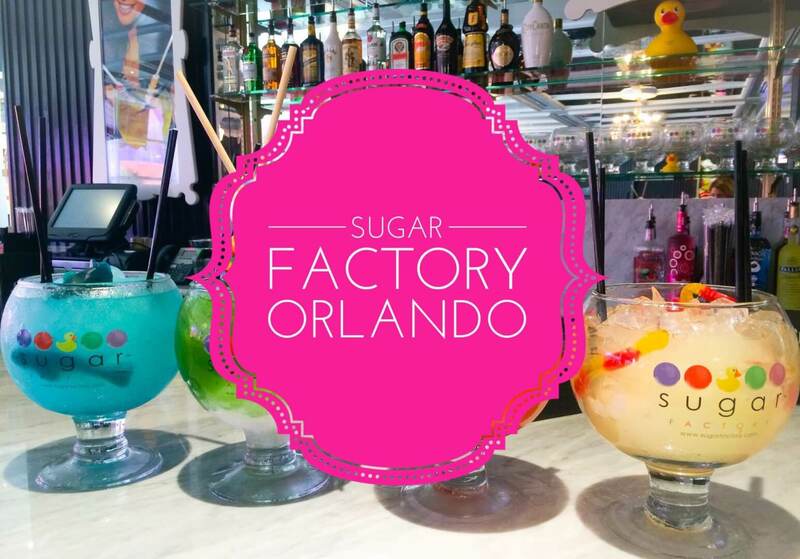 Sugar Factory’s kitchen is open Monday – Thursday from 5pm to 11pm, 5pm-Midnight on Friday, 11am-Midnight on Saturday and 11am-11pm on Sunday. 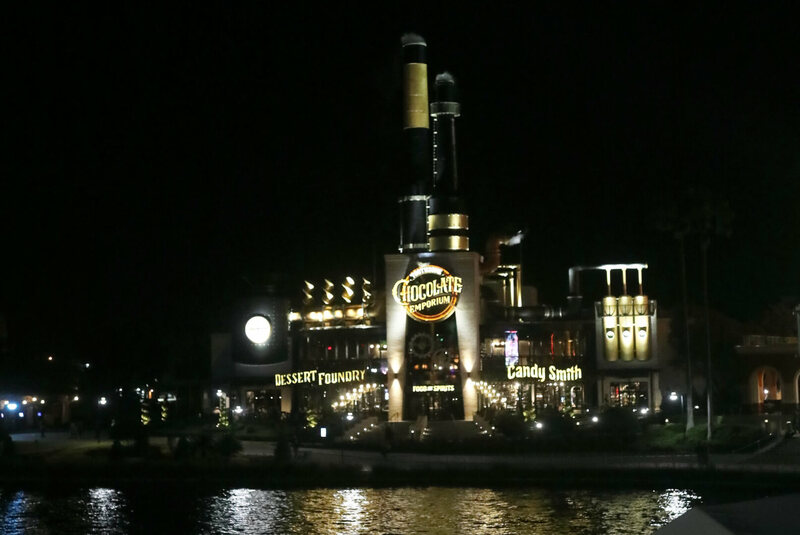 Toothsome Chocolate Emporium serves from daily from 11am, closing at 11pm Sunday through Thursday and at 11:30 pm Friday and Saturday. Atmosphere: Here’s where the two establishments vary greatly. 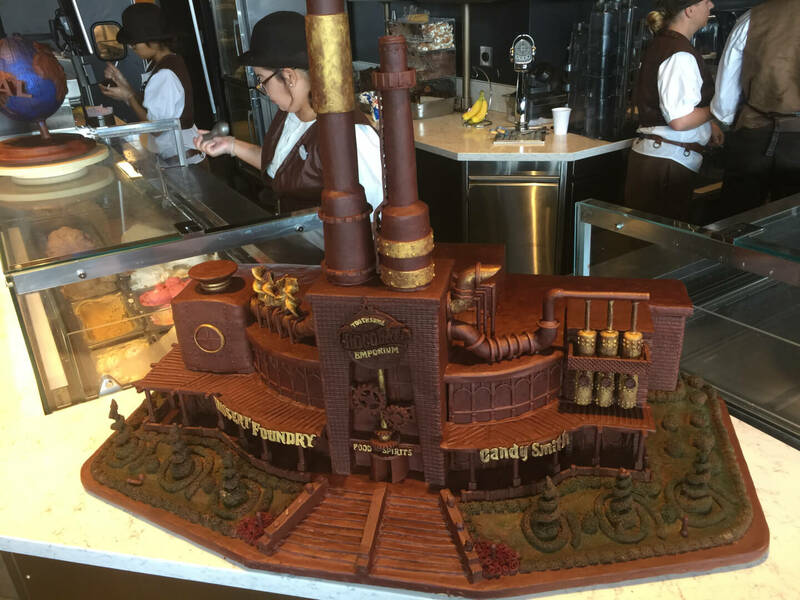 Toothsome Chocolate Factory and Savory Feast Kitchen is a fully immersive, themed experience with staff in costumes matching the Steampunk style of the restaurant. The music is a mix of big band style and jazz to match the décor. 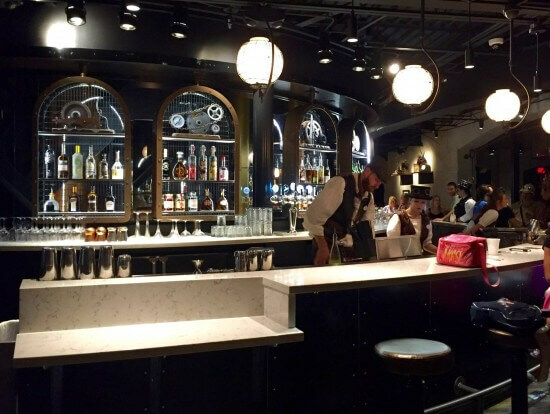 Ambiance at Toothsome is conducive to conversation and the enjoyment of the experience. The staff is overly friendly and helpful. Sugar Factory, on the other hand, with the exception of several chandeliers, is relatively bleak by comparison, with a more modern, almost stark statement. Feeling more like a nightclub than a dining destination, the music is extremely loud and overbearing club style tunes; making conversation (and ordering a challenge). 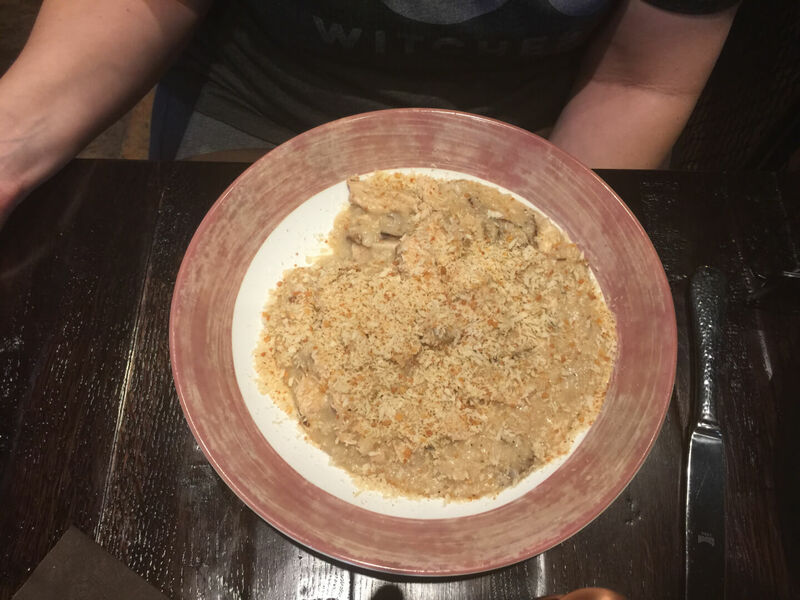 When asked about the volume the staff seemed indifferent only saying “it gets worse” (yes, that’s an actual quote from the waiter). The staff seemed somewhat apathetic barely helpful. Dining: Both locations offer a very tempting menu of specialty cocktails, appetizers and entrée selections for breakfast, lunch and dinner as well as sumptuous signature sweets for dessert. 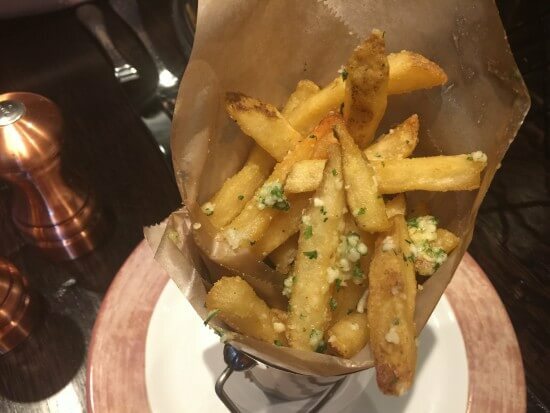 At Toothsome my date and I enjoyed the truffle fries for an appetizer; these were tasty but somewhat average and unexciting. JJ had the Wild Mushroom Chicken Risotto (White truffle oil, parmesan crust) and I, the Fork and Knife Grilled Rib Eye Steak Sandwich (Sautéed onions, mushrooms, tomatoes, arugula, herb shallot aioli, horseradish cheese, toasted onion brioche). 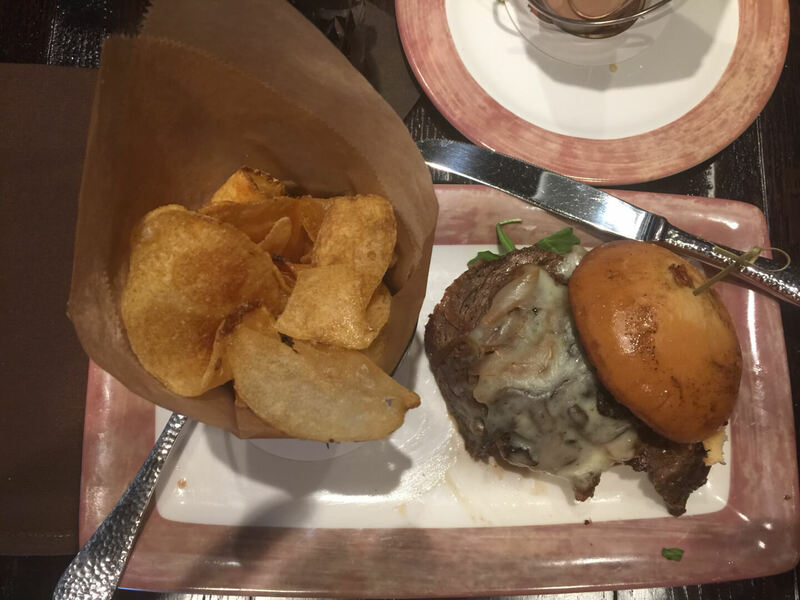 Both selections were just under $15 and fantastically flavorful; the Risotto smoky and mellow and the sandwich, savory and slightly spicy, served with house made kettle chips. Plans included breakfast the following morning at the Sugar Factory, but the less than accommodating staff and overpowering pounding music prompted only a hasty and disappointing retreat (we could barely hear each other or the staff). Menus for Toothsome were not to be found online, but Orlando Informer has transcribed one here; the menu for Sugar Factory can be found here (but you might want to dine outside or bring message boards and gun-range-quality ear protection). Both venues also offered a retail outlet and the option to just order shakes. Given the negative experience with the staff and inhospitable dining atmosphere at Sugar Factory, my personal recommendation for the better dining experience is, hands down, Toothsome Chocolate Emporium and Savory Feast Kitchen. Even though there are no reservations at this time (wait time can be up to 4 hours – as it was one Saturday night DURING Halloween Horror Nights- or as little as 45 minutes, as experienced during our lunch visit), and there is a charge to park at Universal Orlando Resort, the delightfully delicious dining and dessert options, atmosphere, staff attitude and immersive décor more than make up the difference. For more information on this unique restaurant see our story on their opening events here or visit the CityWalk website, dining section here. Disney’s Hollywood Studios reveals full menu for Muppets-themed eatery, PizzeRizzo! Warning!!! The Toothsome Chocolate Imporium Menus are incorrect. The entree’s either have or not have the ingredients listed. I ordered the Waldorf Salad and no where I read that it had blue cheese crumbles. I hate blue cheese. Needless to say, my lunch was ruined as I bit into a chunk of blue cheese. The waitress just shrugged it off when asked and said that most of the menu was incorrect. Glad I did not have a severe allergy. Older Older post: Get your first-look at King Kong in ‘Kong: Skull Island’!